Investing in real estate for most young people sounds like an old man’s game. That partially explains the trend to wait until the forties or fifties to start investing in real estate. The other explanation can be attributed to the perception that you need to learn swimming (read garner experience) before you jump into the sea. This article would break these myths along with ideas to start investing in real estate. Need more time in your young, busy life? As you grow older, you bet you wouldn’t get any more free time than now. Family. Kids. Home. Career. In short, the older you become, the busier you are. So, throw the “busy” excuse out of the window. 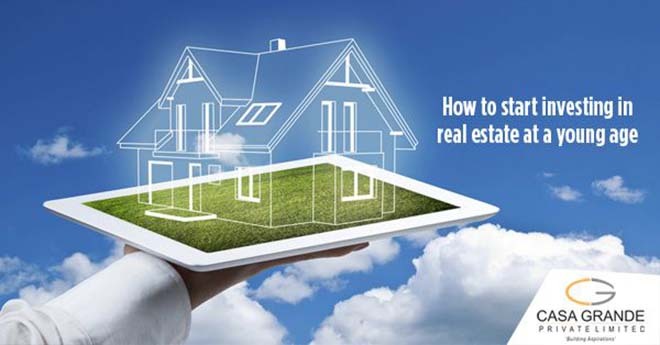 You need to have a fat bank balance to start investing in real estate? Money is definitely important to invest in real estate. But, nobody said that that money should be yours. Until and unless you have done some real bad work with your credit early on, you should be able to land up an EMI based home loan. Need to get experience before burning your hands in fire? Knowledge forms the basis of any investment. And we are not denying that. There are millions of books out there as well as umpteen investment gurus who have shared tips on investing in real estate. So, get started fast and exploit one advantage that you have over the older generation- the ability to learn fast. Learn to sacrifice the lollies for the gem. If you want to be rich down the line, you would definitely be required to sacrifice some low-hanging fruits in the present. Forgo 1 vacation planned next year to make up for a couple of down-payments. Or purchase a car at a cost level below than what you can afford. After all, financial freedom comes at a cost. Make the right moves. Doesn’t matter if they are small. You cannot score a goal without knowing to kick the ball. Start small but definitely make the start. If you cannot afford a Luxury Villa at the start of your career, you can definitely start by investing in a 2 BHK apartment. This start can give your ample returns over a period of time. Get the plan ready. It helps to have a map with you on your journey. Go to the drawing board or pull out a spreadsheet and set down your monthly budget. Push out a couple of luxuries you can afford to forgo and plan the budget that can fulfil your monthly EMIs for real estate investing. Okay, you want to invest. But, what about the risks? Roses do not come without the thorn. But if you are alert, you can avoid the thorns. Similarly, when the question of risks comes into investing in real estate; the best time to take risk is when you have 20-30 years of our job left than when you have 5 years to your retirement. Also, the more you delay, the more you lose out on the power of compounding over the long time frame. In short, investing in real estate at a young age is actually better than investing at a later age; quite contrary to the popular notion. Hence, why don’t you get started now? There’s never a better time than “now”.